I have been doing a bit of reading about the Sun as I sit and listen to the Dussun V8i integrated amplifier. Although an average star, the amount of energy our Sun generates is staggering. Every second, the amount of energy the sun gives off exceeds all the energy used by mankind in all of human history! * This is a big concept, one that makes the mind stagger momentarily, as I conclude, “I have no idea how much power the Sun generates!” I recall Carver’s “Sunfire” amplifiers with a chuckle…cool name, but power-wise a mere spit in the ocean. The V8i, named after the power of the V8 engine, as the top integrated of the Dussun line, would also look quite dim compared to the all-surpassing brightness of the Sun. But, we’ll not compare the amp to celestial objects but rather to the terrestrial technological expectations of the consumer of fine electronics. Is the Dussun V8i a “shining star” among integrated’s? We shall see. Power is the name of the game with the V8i, and plenty of it. For an integrated, amp it’s both big and potent. 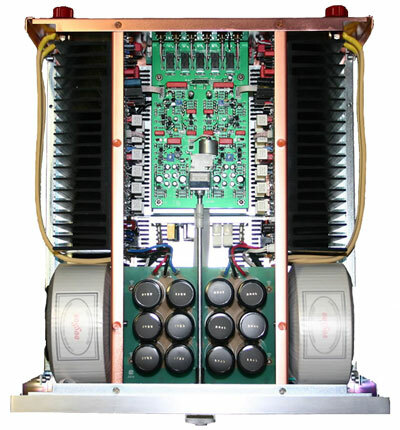 It’s not uncommon to see heftier power amps, but it is arresting to realize that this is an integrated which outweighs many power amps – about 70 lbs! It is a statement in massiveness, and its features reinforce this feeling at every angle from the vault-like volume control to the oversize power and function buttons – even the XL sized knobs on the binding posts on its backside it whisper, “I’m big and I’m bad!” As we’ll see, you don’t “mess” with amps like this. If you do, you could pay a high price. The dimensions of the unit are worthy of comment. Put the Dussun V8i into you room and everyone will know you do serious audio. It can’t be missed. In fact, it’s so large that many audio racks will not accommodate it. This is a component in the tradition of those beastly amps, the ones that you put on top of a very sturdy stand or on a low amp platform. You don’t wedge it into a tight, light shelving system (seriously, this thing could break your inferior shelves)! It is a fair bit taller than most as well, and if your components sit below a screen, you may want to judge how it will fit and where you will locate it before you practice getting a hernia lifting it into place! The faceplate strikes me not as severe but definitely subdued and serious. This amp was not created to win a beauty contest, but more a body-building competition. Completing the façade of the amp are blue LED’s illuminated when each of the five inputs are selected from the amp itself or remote. 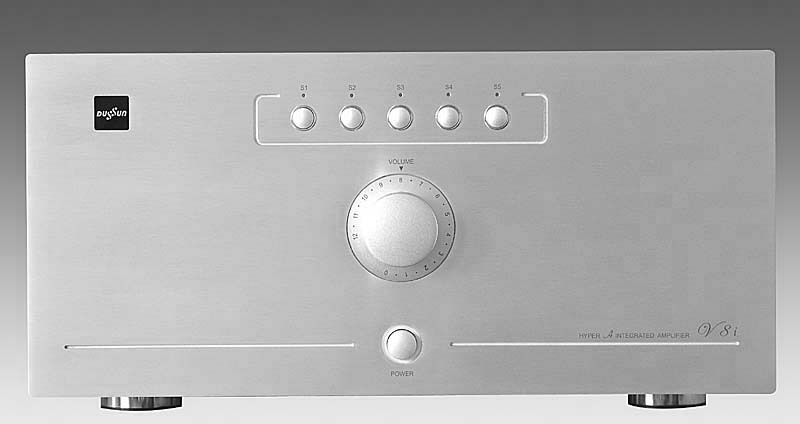 A couple idiosyncrasies of the amp include the fact that without a light on the motorized dial, it becomes difficult to see just where the amp’s volume level is set. Seated from my listening position about fourteen feet from the amp, I cannot without my glasses detect what the level is. I need to plop the glasses onto my face to see, and even then it’s sketchy. There is a redeeming feature however – the blue input LED’s. They each can act as general indicators of how much the level has been adjusted by rapidly flashing as the level is set. With a few minutes practice to get a feel for the motor in the amp, I was able to adjust levels just fine without looking at the volume control. I just watched the LED blinks to get my bearings. The Dussun is not just a turn-it-on and let-it-rip kind of amp. It goes through a process of starting up safely. When the amp is turned on, it sounds softly like a tiny computer hard drive whirring as the amp goes through a “self-diagnose” process and warms up. This is the V8i’s 8 bit microprocessor monitoring the safety of the connections. If a fault is detected, the power will not be sent to the speakers and the LED will flash slowly. Upon startup the volume knob spins counter clockwise, (like some kind of “ghost adjustment”!) to the zero setting and the LED flashes. After about ten seconds, a click is heard and the LED remains lit. Moments later when the LED turns solid, the amp falls silent. This multilevel protection is welcomed when dealing with a component of such power. I noticed that in the startup process the amp defaults to input 1 (of five). I had chosen to use input 3 for my Rega Saturn, but each time I powered up the Dussun, it selected input 1. Of course, the simplest solution is to merely put the most utilized source on input 1. Words of caution are appropriate for any high power integrated, and Dussun takes pains to tell the owner clearly that it’s foolish to just crank on the volume control since it could cause some serious damage to speakers. I found that even with less efficient (89db sensitivity) speakers into four ohms, this amp pushed right through it. I almost never listened any higher than setting 4 out of 12. The power seemed to ramp up exponentially, and a mere tap of the remote brings a sizable increase in power. Thus, one does have to watch what they are doing with the volume. I also found that the power is so substantial that even the quickest tap on the remote pushes the level up significantly. Sometimes it took a couple of “rocking” back and forth taps to find the perfect point, similar to the way a car being parallel parked might require an adjustment. Dussun calls the V8i a “hyper class A” and a “Green” class A solution which achieves class A operation even under conditions of low-power consumption and low heat production. The amp remains in class A mode even if the impedance drops greatly and the power increases several times. It’s not hard to believe that at all, considering that in the interior are sizable heat sinks and hefty toroidal transformers. 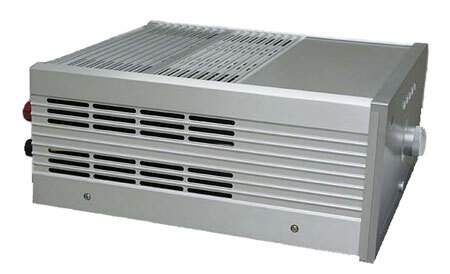 The output stage peak current is 90 A and the transformer capacity for each channel is 1,000 VA. This all adds up to an “are you kidding me” ease even when hooking up inefficient speakers to the Dussun. The amplifier’s case was never hot to the touch even after days of running, and the heat emitted was minimal and less than that from many class A amps, like the older Threshold T-50 that I used to own. The bonus with the Dussun’s protective aluminum casing is that one can place the amp lower to the ground without fear that little fingers will touch something hot. In addition, aesthetically the amp looks far better thought out for not having a ragged appearance with fins jutting out of it. I love the remote for this amp. It’s slung low and tubby, wide like a barge on a river, with a fully rubberized bottom to avoid any kind of nicks on components or furniture, and a matching brushed aluminum top. It fits nicely in the hand and is utterly simple with the five inputs and level controls. It’s appropriate, since it would be a crime to control such an authoritative amp with a chintzy plastic remote. It is very intuitive and easy to use in dim light. If you’ve powered through the minutia to this point you’re in for a real treat, because the V8i did not disappoint in terms of performance. It’s not just another big amplifier, but one with grace. The power that must be so carefully protected against upon startup is the same power that sounds so wonderfully clean, clean clean on every disc! Just as good ‘ol Sol above us needs to operate at a consistent “wattage” and distance, so also the V8i seemed to operate with consistency in all kinds of music, with aplomb and emphasis precisely where needed.